Now is the height of the season for plants from the Mediterranean – suiting that warm but temperate climate that features mild, wet winters and hot dry summers. I aim to post this in time for you to get ideas for your garden when you go on holiday. Whether we will eventually have this climate throughout the UK due to climate change is still not certain, however if you have an area of the garden right now that is sheltered, well-drained and sunny, these could be the suitable plants for you. I’ve been designing themed planting plans for a designer client for a while now and am currently working on a Mediterranean design. I have dealt with the ‘usual suspects’ – olive trees, herbs, lavender – and am now working on a plan inspired by Cleve West in his 2011 Chelsea garden for the Daily Telegraph. In this, he had fallen columns, which I think were a result of visiting ruins in Libya, and his usual brilliant planting. His colours were yellow, white, pale purple and deep red in the main, with some grey and some green from foliage. I also looked at James Basson’s Provencal show gardens to see what grows in that area, and came up with a similar colour scheme to Cleve’s but slightly different planting. I’ve got an arbutus tree (or large shrub) which has white flowers blooming at the same time as strawberry-coloured bunches of fruit (see the top photo on the left). Next to that I have a couple of pale yellow potentilla fruticosa ‘Elizabeth’ (see middle photo). The next layer down consists of knautia macedonica for the dark red flowers, stipa tenuissima as a filler plant (too many flowers together can be distracting) and white ‘valerian’ Centranthus ruber ‘Albus’. 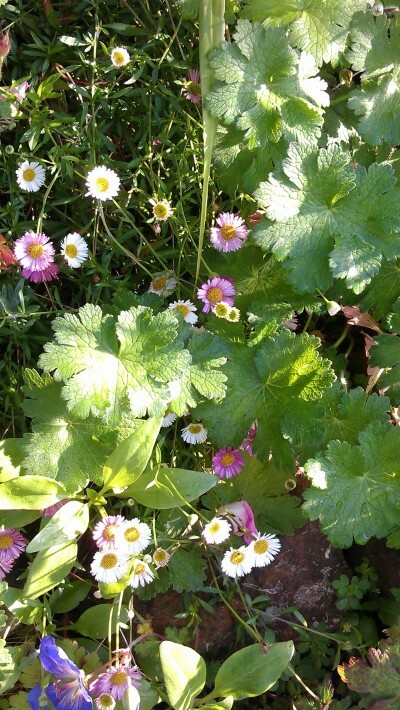 The bottom layer has the sprawling little daisy Erigeron karvinskianus (see photo top right), the deep red pink of Cleve’s design Dianthus cruentus (see bottom photo on left), and some artemisia ‘Valerie Finnis’ (also in the bottom photo) to fill in the gaps and contrast its grey leaves with the flowers. Alliums dotted about will give some late spring colour, however this scheme could need some more spring/early summer flowers, from bulbs perhaps. One thing I loved about Cleve’s garden was that the planting wasn’t everywhere. Some of it was dotted about sparsely among the sandy soil and the fallen columns. This may not be practical with the space you have, but having stones – large or small – could create that effect and emphasise the dryness of the plants’ original habitat. I know I am verging on desert plants here, but the space between plants can be a feature. The stones could serve as mulch, to keep moisture in in the summer, and be part of the drainage system for wet winters.